AzrakHamway.com is a tribute site to toy manufacturer Azrak-Hamway International also known as AHI. Galleries include toys sorted by licensed themes (Monsters, Batman, Spider-Man, Star Trek etc) as well as the companies product catalogs. If you have a catalog or an item that we don’t have, we want to hear from you. Are you an ex employee of Azrak Hamway? Please drop us a line! There are many fans of the company that would like to know more. I’m looking for a carded Lincoln International Mr Rock on the card and am always buying vintage photos of toy stores, click here for more. 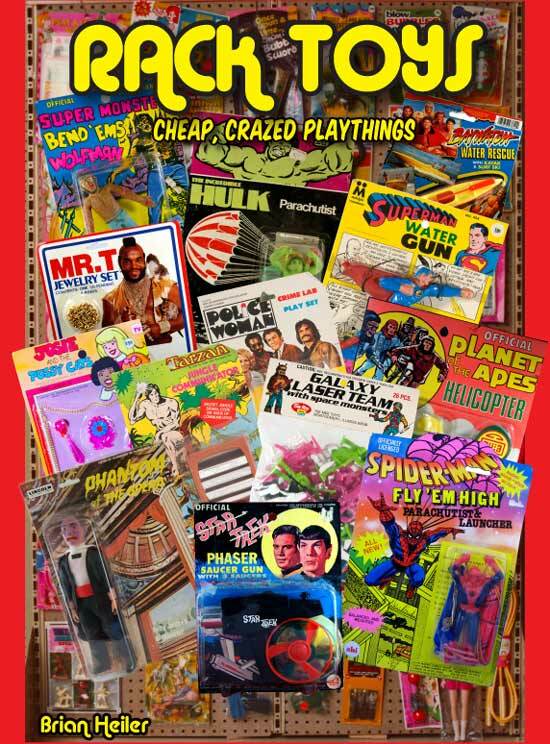 Azrak Hamway toys are heavily featured in the new book “Rack Toys: Cheap, Crazed Playthings” now available from PlaidStallions press. This 144 page examination of those cheap, breakable toys your mom might buy you from the pegs at the grocery store, or the drug store, or the five and ten. Rack Toys: Cheap, Crazed Playthings has hundreds of color pictures of rack toys from the 1950s through the 1990s. Click here to read more about it and order or click here to like Rack Toys on Facebook . I am always buying action figures from Lincoln International or Tomland toys. Click here to see my want list and toys for trade!